Welcome to Some Songs Considered, a column that recognizes they can’t all be zingers and truly appreciates the ones that are. I do not like making predictions. My hottakes are lukewarm before I can even warp them into perfectly crafted tweets. I struggle with presumption, and I’m not confident in my musical opinions unless they’re delicately nuanced (or about The Decemberist’s first 3 LPs). More importantly, I don’t like reducing artists and their careers into objective plausibilities with a 365-day time limit. The high of looking back in a year and seeing I was right about Chvrches’ demise isn’t worth the stress of putting myself in any musician’s shoes and presuming their thought-process. YouTube has been a helpful mobilizing tool for musicians since it was first launched and channels like Vevo have become a staple for any popular musician, but if you haven’t formally acknowledged YouTube as an entertainment medium as impactful as television or radio, then you’re not paying attention. The YouTube music community includes not just musicians, but vloggers, artists, filmmakers, and thought leaders who in addition to their artistic output, create a cult of personality and a devoted community on their personalized YouTube channels (which consist mostly of creative documentation of their lives or collaborative videos with fellow vloggers). And YouTuber fan-bases cannot be underestimated. For fans, YouTube serves as a personal connection to an artist who speaks (seemingly) directly to them on a daily or weekly basis. So when it comes time for YouTube personalities to unveil their primary artistic passions, be it novels (The Fault in Our Stars by John Green # ), television shows (The Grace Helbig Show on E! # ), or in our case, music, they already have a built-in, widespread, diehard audience who immediately springboard their careers in an industry that is currently built almost exclusively around the spreading of buzz. The above video of her doing a violin cover of a Rihanna/Calvin Harris song, for example, has over 34 million views. Troye Sivan, on the other hand, is a more traditional pop star, but his success is tied intimately with his YouTube channel. The 20 year old Australian began vlogging regularly in 2012, making LGBT-friendly advice videos, challenges, tutorials and everyday monologues. Amassing a large following before ever being signed to Universal Music Australia and releasing an EP in 2014, he saw his song “Happy Little Pill” dominate in his home country and eventually go platinum. His following two EPs and first full album hit the Billboard Top 10 in the US. Mr. Sivan’s pop is no musical game changer – on the contrary, its pretty run of the mill saccharine stuff – but his career demonstrates the effectiveness and the ease of using a YouTube presence to catapult a music career. Yes, there was still a traditional marketing push behind this success, but Troye and other dedicated YouTubers have crafted an unprecedented connection with their fans (last I checked he had 3.8 million YouTube subscribers), which helps ensure that his fans will buy (not stream, not steal) their music and will rapidly sell out any venue in a city with an internet connection. While we are in the early days of this trend, I’m itching to see internet-savvy hip-hop artists, punk bands, and folk musicians latch onto this pop-dominated trend and use YouTube to amass a dedicated audience before exploding, seemingly out of nowhere, into the popular music consciousness. These days, music festivals are so common-place and their audiences so hungry that we are going to see a successful rise in niche and uncommonly curated festivals. Simultaneously, expect to see the large, mega-festivals begin to divert from the standard festival formula. With more than enough people attending the big-name fests (see: last week’s column) for reasons other than experiencing music, there has risen a demographic of diehard music lovers who feel like the Lollapaloozas and Bonnaroos of old have left them behind. Festival organizers are beginning to understand that lifelong fanatics, music intellectuals, and even small-time musicians themselves are an underserved group, which means we are going to see more (and better) festivals emerge – like last year’s Eaux Claire festival in Wisconsin which had instant cultural clout for being curated by Justin Vernon of Bon Iver. Eaux Claire featured critically acclaimed rock, pop and folk acts, with big names like The National and a solid line-up of smaller acts, but it chose to leave out the big glitzy pop headliners and party-pleasing DJs. This was a good start, but I think there is space for festivals like these to dig even deeper into specific genres. I mean, at this point, we could curate a successful festival based solely on which artists are the most fun to hang out with backstage and we’d still draw 10,000+ crowds. There are already a handful of niche festivals for music fanatics like Moogfest, Hopscotch, or Basilica Soundscape, and showcase festivals like SXSW or CMJ, but these don’t fulfill that escapist festival experience that was birthed from the legacy of Woodstock. Eaux Claire is a good step in that direction, but I think we’re going to see more of it. On the other hand, the countless mega-festivals draw such reliable crowds, that they might attempt to diversify themselves bit by bit. Currently, the trappings of a festival – from the on-site layout, to the food vendors, to the poster design – follow a certain, bubbly, saturated, celebratory look. 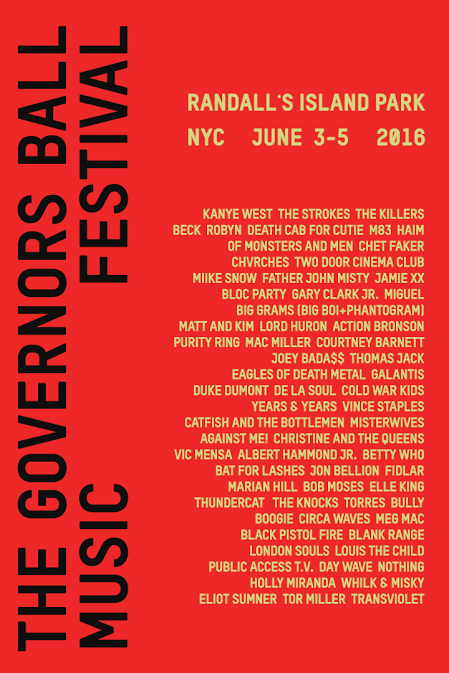 Maybe this only starts with aesthetics, but the Governor’s Ball poster, and its lack of neon-colored excess, is an indication that these mega-fest may begin to carve out stronger, more singular identities. Coachella certainly has the clout to step back and try out new staging ideas, or more purposefully architectural festival grounds. Regardless, the festival is here to stay. So it’s time to start taking some risks with it. Here is where I get really uncomfortable with music predictions: the hometown music scene. I’ve paid attention long enough to observe how DC’s music community treats various genres, and DC, for all its talented punk bands, hip-hop artists, and prog-rockers, cannot retain good pop music. Over the years, we’ve cultivated a handful of talented pop artists, only to lose them to LA once the buzz hits. Misun is a long gone pop figure and Gems left us last year for those sunnier, synth soaked skies. When I found myself really digging the new soul-pop flow of the Walking Sticks’ “The News,” I realized that our time with this group was short. The band has been building a small fire for years now and each new release is more driven and more sculpted. Its undeniably pop, but Chelsea Lee’s newfound power vocals and the group’s increasingly higher production quality are raising them to a new level of notoriety. Though as they perfect their sound and image, I don’t see the DC community rallying around them the way they we do for Beauty Pill or Ex Hex. While the Walking Sticks leaving us would be regrettable, who could fault them for putting their careers first? I think pop can survive in DC at a DIY level, but beyond that, I have to admit that the greater, more loving audiences – plus like-minded communities and crucial infrastructures – are primarily on the west coast. There’s a lot behind this (e.g. DC’s demographics and history don’t make space for us to own a really great pop act) and it deserves a deeper dig than I’m giving it here, but until we as a city figure it out, I’ll be anxiously wringing my hands every time I hear a great hook at DC9 or see a local crowd bobbing away. Unlike Lindsay, I LOVE making predictions. I would gamble on this kind of thing if I could. And I know that sounds a bit braggadocious, but it’s true; I just happen to be very lucky and make obvious guesses have a knack for this kind of thing. In 2013, I went 3-for-4 with my predictions # ; in 2014, I went a perfect 3-for-3 # . So with huge thanks to To Pimp a Butterfly, surprise darkhorse Justin Bieber, TIDAL, and Ms. Weaver – and as I rub myself all over with lucky rabbits’ feet – let me try my best to keep this precognitive streak alive. “Because the current crop of upcoming music-makers now have the technology to breeze through all of recorded musical history, the standard derivation narratives have gotten thrown out the window. No longer is each generation shackled into directly responding to the one that came before it. Instead, each individual is able to carve out their own unique music-listening lineage. One could conceivably end up stumbling upon Pearl Jam and Flying Lotus during the same music-hunting session, and think of how that kind of thing would mess with a burgeoning creative mind. The Indigo Child, the ‘Millennials’, the ‘kids of the internet age’, or whatever you want to call it – there’s a new era of youths coming up that have access to internet knowledge and we’re finding out things a lot faster. I happened to catch Raury at a sold-out U Street Music Hall show a week after I wrote that, and I can attest that the hype is real. Not only does this kid have the silent backing of the establishment (Columbia Records, XXL, BBC, Outkast, SBTRKT, Tom Morello, and Lorde are all in his corner), he has that kind of innate, unpretentious charisma that borders on messianic. All We Need, his 2015 release was unfathomably eclectic and had some solid singles on it, but I think 2016 is the year Raury’s name starts popping up everywhere you look. I came across Will Toledo and Car Seat Headrest last September when they released “Something Soon,” the lead single off of their debut album for Matador Records, Teens of Style. A PR Person You Can Trust, Shira Knishkowy of Matador, had gone out of her way to send me a personal email recommending this 22-year-old kid named Will Toledo out of Seattle (by way of Leesburg, VA) who had already amassed a small cult following thanks to the almost dozen albums he’s self-released on Bandcamp since 2010 (as it quite endearingly turns out, Toledo chose the name Car Seat Headrest because he would record his vocals in the private sanctity of the backseat of his car). And on first listen of his Matador debut, Teens of Style, that onomatopoetically-defined it factor is undeniably there. Toledo may lean on a bit heavy on the Casablancas-y vocals at times, and there is an indelible sameness in terms of the production of the album, but Toledo’s Brock-esque lyrical prowess and Mercer-level songwriting ability do a great job of making up for any reliances on an easy but understandable vocal crutch. I honestly wouldn’t even be surprised if the sonic uniformity of Teens of Style isn’t actually more a case of an overzealous and heavy-handed producer as opposed to Toledo’s true artistic vision. Anyways, I got to see Toledo and the rest of the now fully-formed Car Seat Headrest earlier this winter both at their NPR Tiny Desk taping and at DC9, and one of the main reasons I’m betting on Toledo is because whether he’s playing to 30 people in an office building at two in the afternoon or to 150 people in a dark bar at 11pm, Will is the thing that everyone is paying attention to. With a mumbling, incisive confidence, he’s able to capture, and hold, a room’s attention. Not to mention, his 2015 debut release off Matador Teens of Style was really just a compilation album of some of his earlier work, and 2016 promises to see Teens of Denial – its sequel and Toledo’s first real project created under the guidance of a label. After Car Seat Headrest’s Tiny Desk show, I ended up sharing an elevator with two of Will’s childhood friends and I asked them if it was weird seeing Will become a star in front of their eyes, thinking I would get a great exuberant quote about how amazing his meteoric rise has been. But both friends, without hesitancy yet without any kind of wide-eyed fervor, cooly replied that they’ve always known this was coming for Will. There are more electro-infused indie pop duos in LA than the city’s semi-exclusive, liquor-sponsored loft parties know what to do with, so far be it from me to be bold enough to claim Sego (by way of Utah, who actually call their music “slacker punk”) is the best. Still, after following these guys ever since All Things Go debuted their video for “20 Years Tall,” I just can’t shake the feeling that there is something special about the twosome of Spencer Petersen and Thomas Carroll. At the very least, they’ve proven to be incredibly intriguing to follow (ya know, for as much as an LA-based indie pop duo can be). The Wicket Youth EP that “20 Years Tall” was on boasted four tracks that all boldly and very successfully blended a 90s alternative influence with a more modern disco pop sound – from the whimsical, pulsing “Wicket Youth” # to the uncategorizable “False Currency” # . Then in 2015, they got picked up by Dine Alone Records and put out the Long Long Way From The Fringe EP. And now, finally, on March 4th, they’re set to release their debut LP, Once Was Lost Now Just Hanging Around. The lead single “Obscene Dream” # is a nice addition to their catalogue, but I don’t think it’s the best first impression for this band; it leans way too heavily on the James Murphy-homaging during the verses and while it features the band’s signature tone lyrically – “Note to self / The odds of making something from nothing are not in your favor” – it lacks the sardonic charisma of their other material. Nevertheless, I choose to be optimistic about this upcoming album as a whole. By ditching the sonic signifiers that made her popular in favor of something thicker and more complex, Rihanna joins a tradition that goes back at least to the Beach Boys’ Pet Sounds. It’s also a kiss goodbye to the brighter, sparkier shades of pop and an embrace of the darkly meditative, one-dimensional soundscapes which we all discovered last year – via The Weeknd – are ridiculously marketable right now. Plus, these darker moods read as “artistic,” which conveniently frees one of having to do something, well, actually artistic with an album. In Anti’s surprising final third, Queen Rih ascends from the gutter to belt some ragged soul, but it’s just not enough to shift the mood – the heart of the album is already coated in the thick, sticky goo of trap malaise. Expect the trend of minor-key ballads, muddy synths and one-trick-pony songwriting to continue in major pop music this year. The Pitchfork evisceration of Brooklyn trio Wet’s buzzed-about new album Don’t You represents a death knell for hip R&B-infused indie pop. 2016 will not see a host of new bands touting Brian McKnight and Aaliyah as key influences; the slow jamming sounds of the Clinton presidency are now officially off limits. What seemed fresh and daring in 2012/2013 on albums like Solange’s True and Rhye’s Woman, which hit our ears at the crest of 90s nostalgia and post-James Blake minimalism, now comes off as painfully safe and uninspired. It’s Park Slope wine bar music, and in some ways, it’s always been Park Slope wine bar music. Apologies to all the would-be nu-R&B heroes out there – wood block sounds cued up on their drum machines, Mariah-esque vocal runs lodged in their throats – 2016 is not your time to shine. Do the kids even know Santigold? The Sia before Sia, Santi White was an industry insider/mercenary songwriter who broke out in 2008 with an ingeniously scatterbrained pop album infused with dub here, garage rock there, and genius hooks everywhere. She prefigured the straddling of the indie/corporate line that became commonplace in the pop star ecosystem of the 2010s, from Lorde to Charli XCX. Her latest album, due in late February, has spawned three great singles so far that playfully distort classic pop signifiers in a way that’s actually fun, not intentionally obtuse in the style of the heralded indie crossovers of late (*cough* Grimes). The problem is that, delightful as they are, they’re all mid-tempo and relatively unremarkable on first listen. Their pleasures, like the background la-las in “Who Be Lovin’ Me” and the skittering Rostam Batmanglij-produced bass in “Chasing Shadows” only hit you on the second or third listen. Unfortunately, it looks like this album is set to drop like a rock, go double aluminum foil, and the world will be worse off for it. Maybe, one day, it will appear on some “Underrated Albums of the ‘10s” listicle on whatever we’re calling Random Nerds post-Conde Nast buyout. Love what you read? Patronize Lindsay Hogan.